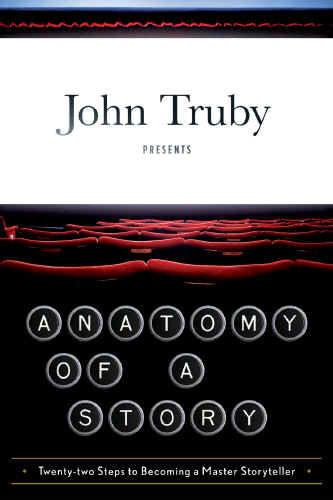 Truby is apparently something called a “story consultant” in Hollywood, and comes more out of the screenwriting milieu than novel writing, but his book on story is universal enough to cover all the varieties. It is rich with ideas and in depth, even more so than the previous two books I looked at here. He has no use for terminology like “rising action,” “climax,” or “progressive complication,” or any other approaches without real practical value for storytellers. I’m not going to attempt to mention everything he covers in 421 pages, but I will try to hit some of the high points that appealed to me. Perhaps this can serve as an introduction to what I think is one of the better books on story, and writing, that I’ve read. The dramatic code is central to his analysis, and the foundation for most of the structural elements he describes in stories. In the dramatic code, change is fueled by desire. According to Truby, the dramatic code is at the core of human psychology. It’s an artistic description of how a person can grow or evolve. The writing process is about decisions, Truby says, and the first important guide to those decisions is the premise of the story. “Your premise is your inspiration.” It should contain the ingredients of the first flash of excitement when the idea of the story first arose. The premise allows the writer to explore the story, and the form it might take, before it’s actually written. Truby counsels that finding the gold in a premise, takes time, a lot of time. He recommends taking weeks to sit and sift the premise. And he provides a suggested methodology to get the most out of it. That’s a lot to think about. In my own case, with the story I’m working on, I’ve already sorted a lot of this out, perhaps more by luck than design. Premise — When an actor can’t get work, he disguises himself as a woman and gets a role in a TV series, only to fall in love with one of the female members of the cast. Designing Principle — Force a male chauvinist to live as a woman. Premise — Track a day in the life of a common man in Dublin. Designing Principle — In a modern odyssey through the city, over the course of one day, one man finds a father and the other man finds a son. According to Truby, a good story has a minimum of seven steps (it may have more) in its progress from beginning to end. These are not external structural requirements, such as imposing a three-act structure. He says, “They are the steps that any human being must work through to solve a life problem.” How these steps are linked will be up to the author, in order to provide the greatest impact. 1) Weakness and Need. The main character is missing a crucial characteristic, has a profound weakness that is holding him or her back from gaining what the character truly needs. Our hero, though, should not be aware of his need at the beginning of the story. 2) Desire. This is different from need, which is the character overcoming a weakness. Desire is a goal outside the character. Desire is more obvious and allows the reader to want along with the hero, and provides what the reader or audience thinks the story is about. Need is more hidden and linked to self-revelation by the end of the story. 4) Plan. The hero’s plan is organically linked to desire and the opponent to be overcome. 5) Battle. The battle is the final conflict over the goal between the hero and opponent. This could be an overt event of extreme violence, or a confrontation through dialogue. 6) Self-Revelation. This most completely can come in both psychological and moral forms. The hero sees himself or herself honestly for the first time, and takes action to prove that changes have occurred. Although there’s much more to explore in what Truby presents, the final thing that I want to mention, and that made a great impression on me, is what he calls the web of character. All the characters must help define the others. Many of the characters serve as opponents to the main character, although they may be a friend or lover, and may be even better people than the hero. He goes on to detail how to create a great hero, how to create character change in the story, and how to build conflict. For instance he describes how better stories go beyond a simple opposition between the hero and main opponent and often use what he calls a four-corner opposition. I’ve barely scratched the surface of the nature of story as presented by Truby. But I’ve found the book very useful and even inspirational. And with my own work, it lets me see the way forward. This entry was posted on May 24, 2014 at 4:48 pm and is filed under Awareness, Book Review, Science Fiction, Writing. You can subscribe via RSS 2.0 feed to this post's comments. Nice to hear from you! I’ve been following your site, but just realized today that you were posting interesting material on pages dedicated to reading and writing…. I’m always a little chagrined to hear from you, since I’m still struggling with writing the long form, and you’ve accomplished so much in your writing adventures.